The vast majority of Connecticut residents who commute by train earn over $100,000 per year, with the largest cohort earning more than $250,000 per year, according to a 2016 Fare Equity Analysis report from the Connecticut Department of Transportation. The report based its numbers off a study conducted by the University of Connecticut, which showed 30 percent of rail commuters earned $250,000 per year or more. “This is undoubtedly due to the heavy usage of the corridor in Fairfield County to access jobs in downtown New York City,” the study says. 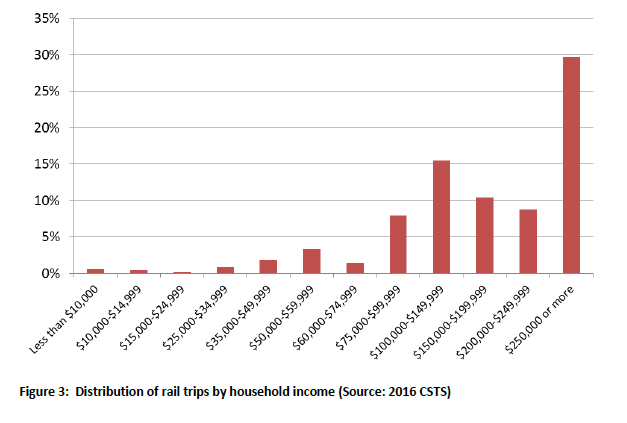 The income distribution graph was used again in CT DOT’s 2018 Service and Fare Equity Analysis. In total, 75 percent of rail commuters earned more than $100,000 per year, according to the report, which was compiled in order to determine how much rail and bus fares should be raised and how to do it in an equitable manner. But “equity” may prove to be a sore spot in Connecticut’s debate over whether or not to install electronic tolls on its major highways. A poll by Sacred Heart University showed a majority of Connecticut middle income residents earning between $50,000 and $100,000 per year reported they were struggling to maintain their standard of living and opposed tolls on the highways. Drivers currently subsidize Connecticut’s public transportation system through the gasoline tax, oil company tax and various vehicle taxes and fees which are deposited to the state’s Special Transportation Fund. In 2019, the STF paid $449.1 million toward public transportation costs, including $211.6 million going toward Connecticut’s rail system, to make up for the fact the train systems don’t pay for themselves through ticket sales. The public transportation subsidy increased by $77 million between 2018 and 2019, which included an increase of $38.3 million in rail subsidies. When Gov. Dannel Malloy sounded the alarm over the Special Transportation Fund in January of 2018, he said bus and train fares would have to be raised and some service eliminated or decreased to deal with the STF’s shortfall. A bipartisan 2018 budget fix enabled the STF to maintain funding and prevented any rate increases or service reductions. State lawmakers and Gov. Ned Lamont have said tolling Connecticut’s highways would enable the state to invest more in its train system, floating a plan to speed up trains along the Metro-North line so commuters can get from New Haven to Stamford, or Stamford to Grand Central in thirty minutes. Similarly, a tolling bill passed out of the Transportation Committee listed $8.4 billion in rail projects to be funded by a combination of toll revenue and federal grant dollars. 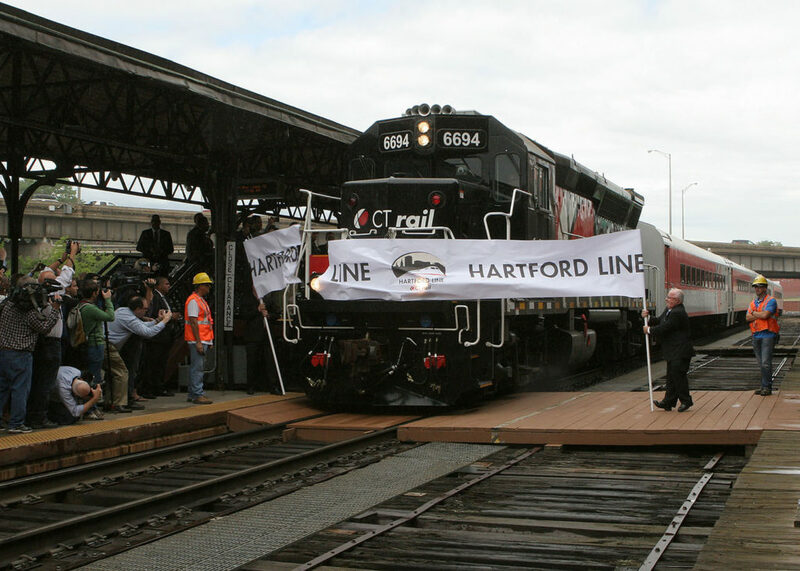 Those projects included rail cars and further investment in Connecticut’s new Hartford Line, which runs from New Haven to Springfield and was completed in 2018 at a cost of $767 million. But, according to a 2015 CT DOT study, only 5 percent of Connecticut commuters take public transportation to work, while 87 percent either drive alone or carpool. According to federal tolling statutes, toll revenue collected on a highway must be used for repairs to that road until such time as the road is in good operating condition, but that hasn’t stopped some other states from diverting toll revenue toward public transportation. New Jersey transferred $158 million in toll revenue from the Turnpike Authority to NJ Transit to help deal with budget shortfalls. Similarly, Pennsylvania diverts $925 million in toll revenue and vehicle fees to subsidize the public transportation system in Philadelphia. But Pennsylvania’s toll revenue diversion has come at a price: escalating tolls, which increased 6 percent last year, and a lawsuit challenging the constitutionality of the toll increases because the money is being used for projects unrelated to the highway system. The lawsuit was brought by the Owner Operator Independent Drivers Association and the National Motorists Association and is seeking nearly $6 billion from the Pennsylvania Turnpike Commission. Toll rates for the Pennsylvania Turnpike have increased for eleven straight years and those increases are expected to increase until 2044. Gov. Tom Wolf said the cost of tolls on the highway is driving away business. So why not provide subsidized tolls for low-income users of tolled roadways, which becomes relatively easy with EZ-Pass and cashless tolling? That seems most equitable to me, given that train riders are providing a public benefit (decreasing traffic congestion) by not driving. Anyway, they also pay a fare to use the train, which is probably more than the roadway toll in the first place. Eric, If you’re an advocate of cashless tolling you should read the investigative reports about how badly that is working in NYS. Go to lohud.com and search for cashless tolling investigation. It’s scary.